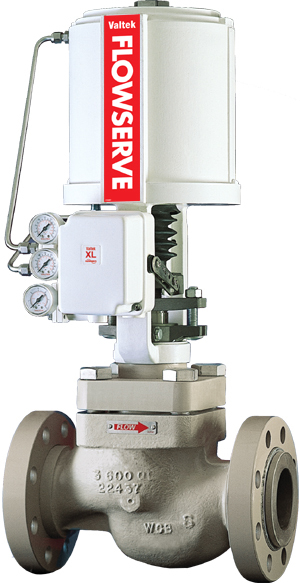 The spring-cylinder actuated Mark One valve provides stiffness and maintains high positioning accuracy, repeatability, controlled high speed, and faithful response. The Mark One valve handles up to 150 psig (10.3 barg) supply air and has the thrust to shut off against much higher fluid pressures. The Mark One valve is designed so the spring, supply air pressure and fluid pressure itself combine to produce exceptionally tight shutoff. A self-aligning seat ring further enhances the shutoff capability of the Mark One valve. The Mark One valve is typically double top-stem guided and completely avoids contact between the plug and seat retainer. Many globe valve maintenance problems can be traced to cage-guiding. The close metal-to-metal contact between the cage and plug often result in galling and sticking. The clamped-in seat and top-entry trim permits easy, quick maintenance. Plus, with the Mark One valve’s high degree of parts interchangeability, fewer inventory parts are required. In addition, the actuator is lighter, smaller and easier to handle than comparable diaphragm actuators. The Valtek Mark One control valve is the industry choice for a simple, reliable, tough globe valve.